Pindola Bharadvaja (Skt. Piṇḍolabhāradvāja; Tib. བྷ་ར་དྷྭ་ཛ་བསོད་སྙོམས་ལེན་, Bharadodza Sönyom Le; Wyl. bha ra dhwa dza bsod snyoms len) — one of the Sixteen Arhats. Born into a family of royal chaplains, he found no meaning in this life. Seeing the gifts and favours that were bestowed on the Buddha's disciples he had decided to become a monk. 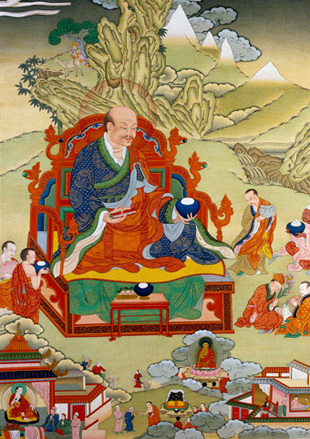 At first he was very greedy, and went about with a large alms bowl, however, following the Buddha's personal advice he conquered his greed and lived strictly on whatever he received and soon became an arhat. He constantly showed his gratitude to the Buddha by obeying his words and working only for the benefit of others. Pindola Bharadvaja lives in a mountain cave on the eastern continent (Purvavideha) with 1,000 arhats. He carries a scripture in his right hand and an alms bowl in his left which he uses to aid those in the lower realms, conferring wisdom and granting wishes, protecting from misfortune. This page was last edited on 6 August 2017, at 00:00.